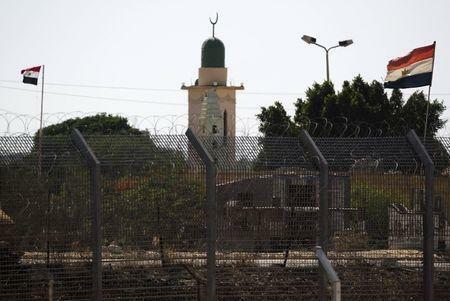 ISMAILIA, Egypt/CAIRO (Reuters) - Islamic State militants launched a wide-scale coordinated assault on several military checkpoints in Egypt's North Sinai on Wednesday in which 50 people were killed, security sources said, the largest attack yet in the insurgency-hit province. The onslaught marked a significant escalation in violence in the Sinai Peninsula, located between Israel, the Gaza Strip and the Suez Canal, and raised questions about the government's ability to contain an insurgency that has already killed hundreds of police and soldiers. It was the second high-profile attack in Egypt this week. On Monday, the prosecutor-general was killed in a car bombing in Cairo. Islamic State's Egyptian affiliate, Sinai Province, claimed responsibility for the Sinai attacks in a Twitter statement. The army said five checkpoints were attacked by about 70 militants and that soldiers had destroyed three landcruisers fitted with anti-aircraft guns. The fighting, which raged for more than eight hours, was the biggest onslaught yet in the insurgency. One security source put the number of militants at about 300, armed with heavy weapons and anti-aircraft weaponry. Security sources said the militants had planned to lay siege to Sheikh Zuweid town, where most of the fighting has been concentrated, by hitting all army checkpoints simultaneously. "But we have dealt with them and broke the siege on Sheikh Zuweid," one of the sources said. Army F-16 jets and Apache helicopters strafed the region. The insurgency, which is seeking to topple the Cairo government, has intensified since 2013, when then-army chief Abdel Fattah al-Sisi removed President Mohamed Mursi of the Muslim Brotherhood after mass protests against his rule. Sisi, who regards the Brotherhood as a threat to national security, has since overseen a harsh crackdown on Islamists. The courts have sentenced hundreds of alleged Brotherhood supporters to death in recent months. Mursi himself, and other senior Brotherhood figures, also face the death penalty. Sisi's government does not distinguish between the now-outlawed Brotherhood - which says it is committed to peaceful activism - and other militants. The exact breakdown of identities of those killed was not immediately clear. Security sources said at least 36 people, including soldiers, policemen and civilians were killed and 38 militants were also killed. Doctor Osama el-Sayed of El-Arish General Hospital in the provincial capital said 30 bodies had been brought in, "some of whom were wearing army fatigues". Security sources said militants had surrounded a police station in Sheikh Zuweid and had planted bombs around it to prevent forces from leaving. The militants also planted bombs along a road between Sheikh Zuweid and al-Zuhour army camp to prevent the movement of any army supplies or reinforcements. They also seized two armoured vehicles, weapons and ammunition, the sources said. "We are not allowed to leave our homes. Clashes are ongoing. A short while ago I saw five Landcruisers with masked gunmen waving black flags," said Suleiman al-Sayed, a 49-year-old Sheikh Zuweid resident. Ambulance medic Yousef Abdelsalam said he was at the entrance to Sheikh Zuweid but could not enter because of warnings that the road was rigged with bombs. Witnesses and security sources also reported hearing two explosions in the nearby town of Rafah, which borders Gaza. The sources said all roads leading to Rafah and Sheikh Zuweid were shut down and residents were staying in their homes. Sinai Province said in Wednesday's statement that it had attacked more than 15 security sites and carried out three suicide bombings. terrorism military campaign in the Sinai over the past 6 months, the IS ranks are not decreasing - if anything they are increasing in numbers as well as sophistication, training and daring," Aimen Dean, a former al Qaeda insider who now runs a Gulf-based security consultancy, said in a note. In Cairo, security forces stormed an apartment in a western suburb and killed nine men whom they said were armed, security sources said. The sources said authorities had received information the group was planning to carry out an attack. Among those dead was Nasser al-Hafi, a prominent lawyer for the Muslim Brotherhood and a former lawmaker. Islamic State had urged its followers to escalate attacks during the Islamic holy month of Ramadan which started in mid-June, though it did not specify Egypt as a target. In April, the army extended by three months a state of emergency imposed in parts of Sinai. The army has taken several measures to crush the insurgency. Besides bombardments in the region, they have destroyed tunnels into the Palestinian-ruled Gaza Strip and created a security buffer zone in northern Sinai. The army is also digging a trench along the border with Gaza in an effort to prevent smuggling. Under the terms of Egypt's 1979 peace accord with Israel, the Sinai is largely demilitarized. But Israel has regularly agreed to Egypt bringing in reinforcements to tackle the Sinai insurgency, and one Israeli official signalled there could be further such deployments following Wednesday's attacks. "This incident is a game-changer," an official told Reuters on condition of anonymity.